Om Shri SatChitAnand Sadguru SaiNath Maharaj Ki Jai ! I feel so blessed and lucky to be able to work for what i love most. To devote most of the time on what i love most. 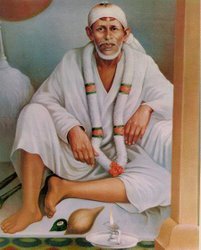 About an hour ago i watched a Shirdi Sai Baba video and post it on Sai video blog. Watching the video song of Shirdi Sai Baba, listening to chanting of Sai Baba Mantra. It was all so pleasing. Then as body felt a bit tired wrapped my body in Sai’s clothes hugged the Sai SatCharitra and had rested in Sai’s love and grace while chanting His holy name. I am back into love from love. Back to, writing Sai Baba stories, which guides me and guides so many souls. 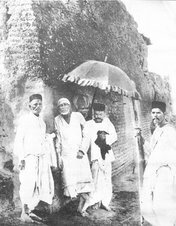 In the blog post worshiping Sai Baba (<<<would recommend to go thru post if you have not yet) there is a mention, about a story of devotee named Mahali. Today this story of Shri Sai is due. Before it, i would like you to know the source of this story, it is a beautiful book named, "Baba’s Vaani" , His teachings and sayings by Vinny Chitluri. The story in the book is titled as, "Mahali loved Baba passionately." I will not copy the story here exactly, the way it is written in the book. 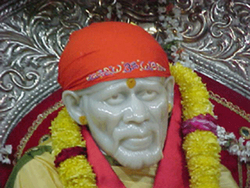 The story in Baba’s Vaani is referred from : Shirdi che Sai Baba by Dr. K. B. Gavankar. Incidentally, this book originally written in Marathi has been translated into Englis and Gujarati languages. Those interested to buy it can contact Dnyanesh Gawankar for the same. There was a lady named Ravu, her in-laws called her Radhe. Baba used to assign names to many devotees which had meaning to those named. 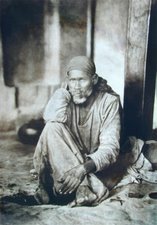 You might like to go through pictures of Contemporary devotees of Shirdi Sai Baba, which have names of devotees along with the names with which Shirdi Sai use to call them. Sai Baba called her Mahali. She had visited numerous dharmik Kshetra (sacred pilgrimage places in India). She reached Shirdi, and she stayed there because of her intense love and devotion for Baba. 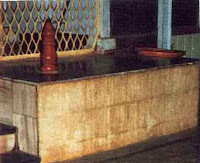 Due to scarcity of water in Shirdi during those days, there were no gardens or flowers readily available in Shirdi. 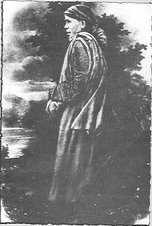 Nonetheless, Mahali would wander in forest in search for wild flowers and offer them to her beloved Shai Baba. Sometimes with love she would weave garland with these flowers. With overflowing joy from her heart and being, she would offer it to her Shai Baba. Shri Sai would accept this offering of love and would keep her garland around His neck the whole day. At other times Mahali picked fruits from forest and offered them to Sai. Baba accepted them and ate them. Sai would also call her out and offer her food from the Bhiksha, He received. Once Sai Baba visited her in her dreams. Mahali was too happy and exited to share her dream with everyone. “Baba came to my dream and kissed my cheek and said, “Mahali, I will bless you with spiritual upliftment. I will give you one finger. Whoever is angry with you, i do not associate with them. Mahali, I will give you jewelry and money. 1 rupee, 2 rupees, 5 rupees I will give you henceforth, and I will stay with you." One more similar story of this unique Spiritual Guru, comes to my mind. 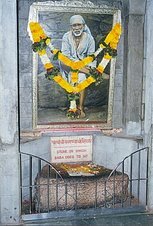 Once Shri Sai was sitting in the Dwarkamai. The sacred place was crowded with people, even outside the condition was same. People, seeking His grace, blessings and boon. Plentiful of dishes with variety of food were placed before the Gracious One. Sai told Shama that Her aayi was waiting outside, that he should go and bring her to Him. Shama piercing through the gathered crowd reached where Sai Baba had pointed. He saw and an old lady, too tired in ragged clothes. He respectfully guided and helped her way to the sacred Dwarkamai, in front of Baba. Sai was too pleased to see her. The lady was chocked with the feeling if immense gratitude. Baba smilingly asked the lady about what she was hiding in her clothes. The lady reluctantly offered the chapatis she had. 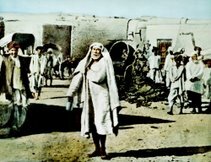 SadGuru Sai leaving aside all the other dishes, relished the chapatis, as tears of gratitude fell from the old lady’s eyes. Nobody can describe the joy that her heart felt. Nobody can describe the love of Baba she felt. She ha d traveled long on her feet. With intense love for Baba. The chapatis she carried specially to offer them to Sai, she did not felt right to offer the same, at that moment, as chapatis was in very bad condition. For Baba it was the most delicious meal. Om Sai ! Om Sai ! Om Sai ! You are my saviour and i trust you blindly. Do not turn your face on me, help me and i see you as my father. I am your daughter and you are the only one who can remove me out of my troubles. Be with me all the times and guide me through difficult ways. Stop me if i m doing any wrong things. 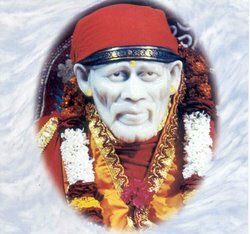 I love you saibaba. Om Sai Ram, Baba you know what Problems i am facing currently. Please guide me Baba in the decisions i make and kindly support me in all the ways. As my brother is looking out for a good job please guide him in the correct path.